Ms. Hinano Sugimoto will be the representative of Japan at the 2018 Miss International beauty pageant, which is scheduled to be held from 14:00 on Friday, November 9, 2018, at the Tokyo Dome City Hall in Toshima-ku, Tokyo, with contestants from about 75 countries and regions around the world. We asked Ms. Sugimoto about her reasons for applying in the first place, her efforts up to the moment when she was selected as the Japanese representative, and her ambitions for the international pageant. —What were your reasons for applying to be the Japanese representative at 2018 Miss International? I am now studying in the University of Tokyo’s Department of Applied Physics in the Faculty of Engineering. But before entering university, I went to girls’ junior and senior high schools, where I was surrounded by girls just like me. My circle of friends was limited. I always felt that my view of the world had been very narrow. In my second year at university [Ms. Sugimoto is now in her fourth year], I became aware that it would be difficult for me to new challenge things once I graduated and entered society, so I wondered if there was anything I could do before then. I was searching for something to do. Then I happened to meet a former Miss International contestant. Until then I didn’t have a very good image of beauty pageants. I thought they were just beauty contests in which women competed over their looks. But this former contestant was not only extremely beautiful on the outside, she also exuded an amazing aura from the inside. Her inner self was very beautiful. Her behavior wasn’t at all pretentious, either. Everyone she met she looked straight in the eyes, and her affectionate approach was wonderful. Her personality, if you like, was awesome. After that encounter, I searched into the Miss International Pageant and found out that actually it was a wonderful contest. I thought that if I applied to enter, in my final student days, I would be able to polish myself both externally and internally, meet a lot of people, and get to see various worlds. So at the end of my second year, I applied. —What were your feelings at the moment when you were selected as the Japanese representative to 2018 Miss International? For two months before the national contest the finalists would gather about once a week for a seminar. Those occasions provided me with plenty of opportunities to think about what my dream was and to take another look at myself. In the process, all of us strengthened our desire to become the representative of Japan. I myself really wanted to be chosen as the Japanese representative, but there were contestants who had an even stronger desire than me, so I really didn’t believe that I would be chosen. Even though I had wanted it so much, the moment in the national pageant when I was chosen, I really just couldn’t believe it. It was like, Why me? To be honest, the moment it was over, I wondered whether I would be okay. My mother had come to see the contest. When I looked into the audience, I caught sight of her delighted face, which made me feel happy and satisfied. I felt relieved that I had done my best. My mother had devoted herself to supporting me, cooking high-protein and low-carbohydrate meals for me every day. I had wanted to win for my mother’s sake as well, because she had done so much for me. —Miss International is not simply a beauty contest but also a celebration of world peace. What do you think is necessary to realize world peace? This is maybe a hackneyed reply, but I feel that international mutual understanding is very important. In my senior high school days, I was the head of a volunteer group in our school. One time we sent some stationery that we no longer required to an orphanage in the Philippines. We sent them through an intermediary business without any explanation of our activities or why we were sending them. Later we received a DVD-Video from the orphanage. I was sure that the children would have been delighted, but when I watched the DVD-Video, there were just these expressionless children, no smiles on their faces at all, saying thank you with no emotion whatsoever. They just said thank you, and then the DVD-Video ended. That was a great shock for me. Clearly the children had not been delighted at all. Worried, I asked someone living in the Philippines to explain their response. In the first place, I was told, these children don’t know about the world and don’t know about Japan. They would not understand why people in a wealthy country would send so much stationery to complete strangers. Rather than being happy to receive them, I was told, they couldn’t understand the throwaway attitude. They probably found the donation rather disagreeable and difficult to accept. I was so shocked. It was all our fault. We should have explained properly. I hadn’t imagined that cultures were so different. I still remember that incident as a very shocking event. My image of world peace is that depicted especially by advanced countries, but before that I think it is important for us to have more respect for the cultures and feelings of people concerned and to reach out to others. Rather than big projects based on grand policies, I think there needs to be more contact at the individual level. —What are the attractions of Japan that you want to publicize as the Japanese representative? I became the Japanese representative for the following year’s Miss International on October 30, 2017. About two weeks later, on November 14, the 2017 Miss International Pageant was held, and the top five contestants decided. After the pageant, six of us, the top five contestants (four foreigners and one Japanese) and me, spent about a week making courtesy calls to related persons and attending other events. When they were asked by people what they liked most about Japan, all four foreigners replied that they liked the Japanese people. I keenly felt that for women of my generation, what resonates most is the warmth of the Japanese people. And as the Japanese representative, that is how I want to be myself. 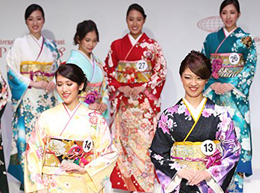 We’ll have to wait and see, of course, but around 70 contestants from overseas will be coming to Japan for the pageant. I will try hard so that when we are together, they feel that warmth. —What is your idea of a beautiful woman? As I said at the start, I think a woman who is beautiful on the inside is really beautiful. People will naturally gather around women who are beautiful on the inside. They have an aura that makes people happy. Such women are more beautiful than models who are only glamorous on the outside. I hope that I can become such a woman. —Finally, what is your ambition toward the 2018 Miss International world pageant? In the national contest I was chosen from among several finalists, so of course I will try hard in the international pageant to finish first. But at the same time, in my current activities, I am often being told that it will be a rare opportunity to spend about a month together with contestants from 70 or so countries around the world and to make friends. So I am looking forward to enjoying the month and cherishing the encounters. As the Japanese representative in the Miss International pageant, publicizing Japan is a major objective for me. First of all, I want the 70 contestants to become fans of Japan. At the same time, though, I hope that we can become mutual fans and that the event serves as a major pipeline between individuals and between nations. Born in Kobe, Hyogo Prefecture. Studying in the Department of Applied Physics in the Faculty of Engineering at the University of Tokyo. Won both the Grand Prix and the Perfect Body award at the national contest to select the Japanese representative at the 2018 Miss International beauty pageant. Conducting PR activities around Japan ahead of the holding of the 2018 Miss International world pageant in November 2018.